Instant Pot Congee is quick and easy to make. It's a one pot chicken and rice Instant Pot meal. Make this jook recipe for breakfast or for dinner. 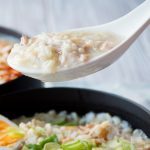 Get this recipe for Instant Pot Chicken and Rice Congee at https://www.theworktop.com/breakfast-brunch-recipes/savory/instant-pot-congee-chicken-rice/.